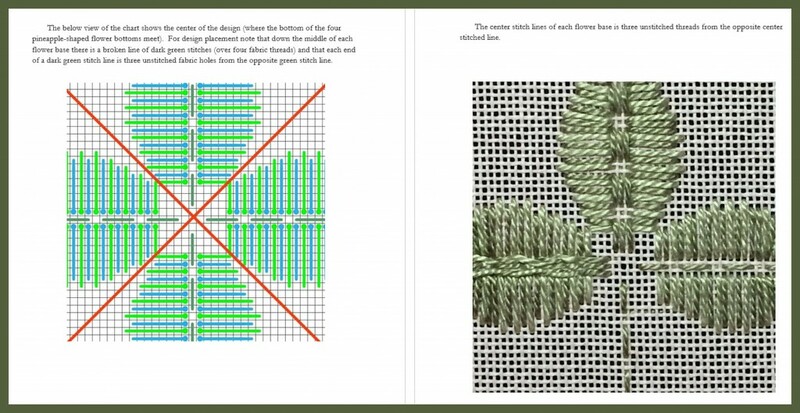 Ribbons and Thistle Flowers is a counted needlework embroidery design presented in a 40-plus page booklet available in printed and Kindle formats. 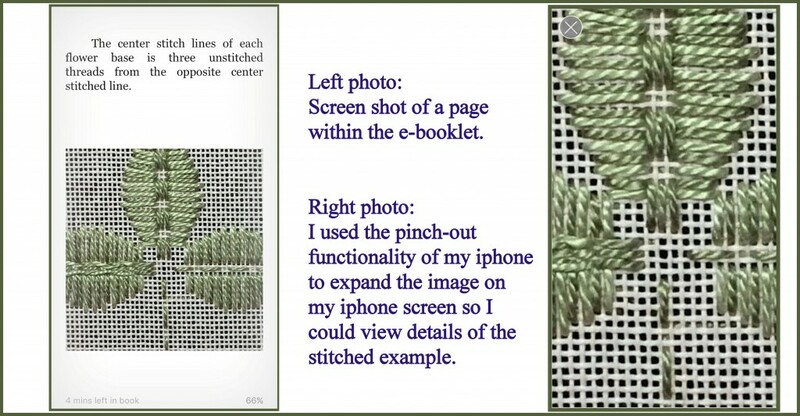 Click the button named Bargello on the upper navigational bar of my blog website at Noelle Frances Designs to view my discussion of the Bargello straight stitch and how to start and end your stitching thread without the use of knots. Every summer I look forward to the appearance of my favorite flowers along the fence line of our neighbor’s meadow, the purple thistle. So pretty when they bloom, so painful if you bush against their prickly rosette leaves when wearing open-sided flip flops. 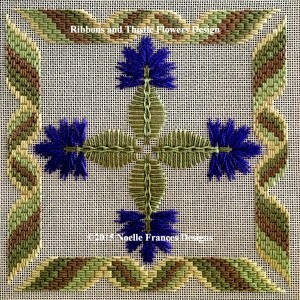 My dark blue violet thistle flowers are bordered by Bargello style ribbons. This is a counted needlework design: 125w by 125h in size. This is approximately 7.5 inch square when work on 18 count canvas. My booklet Ribbons and Thistle Flowers, 52 pages in length, is offered in ebook format and printed as a 8 by 10 inch paper bound booklet. I work my charts twice. Once during design phrase then again after I have finalized my booklet. 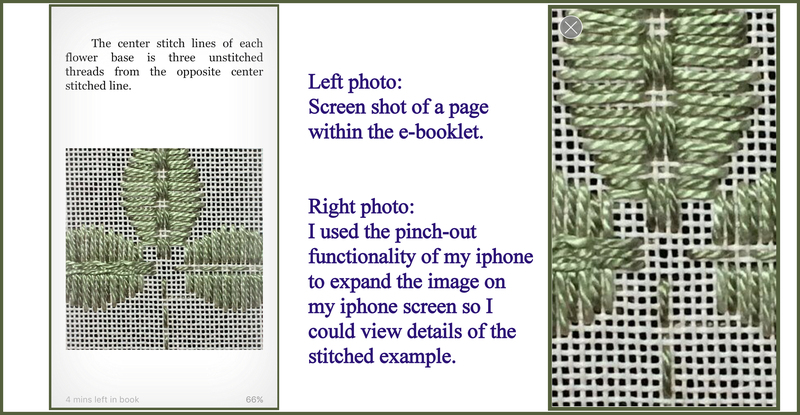 Using my iPad or iPhone I expand the stitch charts and detailed photos down to the stitch level to assign me as I stitch. Two sample pages from the printed booklet are shown below and a screen shot of one of these sample pages is from viewing the ebooklet on my iPhone. Printed booklet 8 by 10 inches, two pages shown. 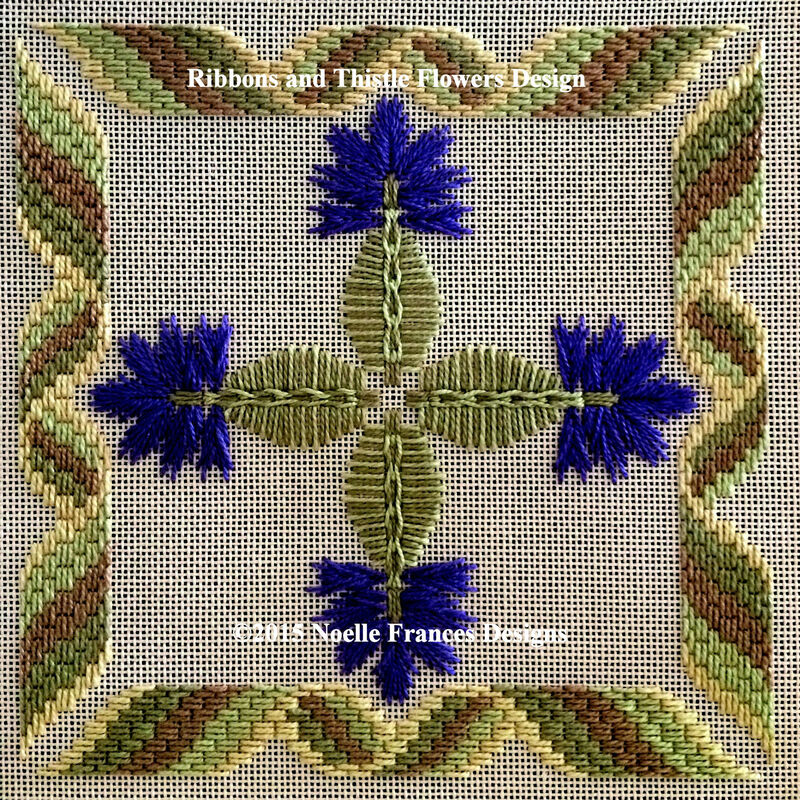 Click the below photo for ordering or to access the Look Inside feature to view a few pages of the booklet for the Ribbons and Thistle Flowers design.